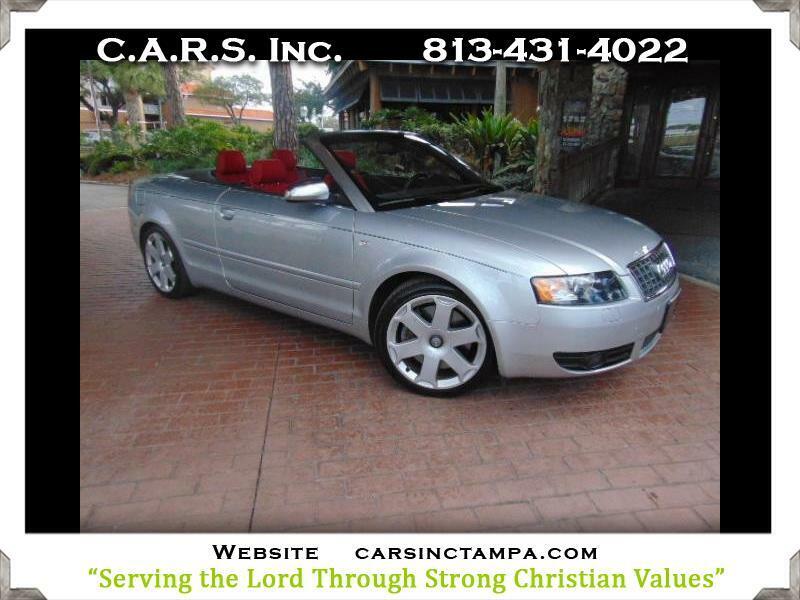 Used 2004 Audi S4 V8 S4 Cabriolet Quattro for Sale in Tampa FL 33609 Complete Auto Remarketing Specialists C.A.R.S. Inc. If Quality is your First Priority....We should be First on Your Automobile shopping List.... Reduced February 26th to just $10950.....WOW Factor.....V8 All Wheel Drive Audi S4 Cabriolet......Rare Crimson Red Leather Upholstered Seats Trimmed In Black......New Speed Rated Radials.....Excellent Power Operated Factory Black Canvas Soft Top.....Dual Power Memory Driver and Passenger Seats.....No Accident or Paintwork History.....Full Maintenance Service Included....Oh Yeah.... AWD V8 Cabriolet....WOW Factor....Pictures Are Worth A Thousand Words..... If Quality is your First Priority....We should be First on Your Automobile shopping List....... When Shopping for a Pre-Owned Vehicle, it is our Position that Quality, Dependability and Condition are far more important than “Low” price….. You may never hear anyone refer to our prices as being the Lowest….However You will find most everyone to say that we are “Fair” And “Honest” and We offer a Very Good Value for the Monies Spent…...We Do Not Charge Any Additional Dealer Fee’s and Every Vehicle is extensively Inspected and all Maintenance Service is performed by our own ASE Certified Technician prior to delivery.......And hopefully our Christian Values and Our Passion to Please our Clients is Indicative of Our Actions.....We have the distinction of having one of the most Experienced and Courteous Staff of Employees of any Independent Auto Dealership in the USA. Our Owner Celebrate 50 years of Automobile Sales on June 15th of this year.